Love under the Indio sun! 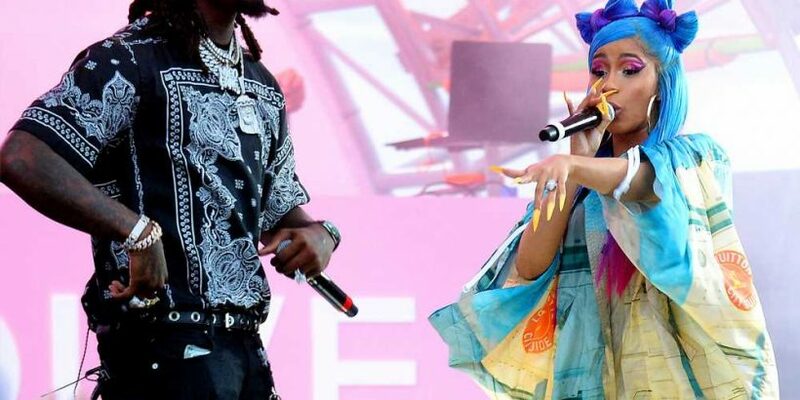 Two days after sharing the stage with Selena Gomez at Coachella, Cardi B and husband Offset performed together at Revolve Festival, one of the music event’s hottest parties. In addition to spitting some bars during their time onstage, the pair also shared a sweet kiss on the lips. The “I Like It” rapper, 26, sported a very colorful outfit for the daytime outing, opting for a multi-colored oversize top which she paired with a pair of brightly colored sneakers. Completing the outfit, Cardi tied the look together with a long blue-and-purple wig with two bow-shaped buns. Meanwhile the Migos rapper, 27, wore a black bandana-print top with a pair of black pants and a baseball cap. Of course their PDA didn’t stop there! On Sunday, Cardi shared a sweet video of Offset nuzzling her neck on her Instagram Story, while Offset showered his love with some cheeky admiration. The pair, who share daughter Kulture Kiari, 9 months, appear to be in a good place with each other since reconciling following their brief split in December. After returning from a romantic vacation to Los Cabo, Mexico, last month, Offset shared a sweet photo of himself carrying Cardi on his back. “RIDE OR DIE FOREVER LOVE YOU NO MATTER WHATS GOING ON I LOVE YOU BEST MOTHER AND HUSTLER I KNOW,” Offset captioned the shot. In March, the Atlanta-born rapper also opened up about his controversial decision to crash Cardi’s concert stage and beg his wife for forgiveness following their brief split. “I love my wife, so it’s serious — it’s not a game to me,” Offset said on The Ellen DeGeneres Show, explaining to host Ellen DeGeneres why he chose to go public with his apology to Cardi.